Tai Chi (Taijiquan) is a martial art some few hundred years old. An important element is a series of linked movements called a “form” which is based on fighting movements. There are “empty hand” forms and weapons forms. In the 1920s three major figures in Taiji worked together to adapt the empty-hand forms of their respective styles. Yang style’s Yang cheng-fu and Wu style’s Wu Chien-chuan smoothed out the forms and got rid of explosive postures, jumps and other abrupt time changes to make their forms easier for the general public to learn. Sun style’s Sun tu-t’ang also created a style with smooth, flowing movements omitting more vigorous martial elements. The work of these masters during this decade saw the emergence of what could be called “Tai Chi Exercise” with its distinctive slow, even movements that are practiced primarily for exercise rather than emphasising vigorous martial training. It must be stressed that all styles of Tai Chi have kept the full martial art training for those who want to pursue that path. The fourth major Tai Chi style – Chen – did not adapt its empty hand form and today still contains explosive fast movements with the slower gentler ones. The Simplified 24-Step Taijiquan was created by a group of masters organised by the Chinese State Physical Culture and Sports Commission in 1956. The form was simplified, repetitions removed and postures balanced by performing them on the opposite side. The form takes no more than five minutes to perform. Cheng man-ching’s Simplified 37 Posture Form was created probably in the early 1950s. Cheng eliminated most repetitions and removed some postures, which reduced the performance time to about ten minutes. The postures are performed with the spine more upright. It was not until the 1960s that it became widespread. In recent decades there has been more focus on introducing Tai Chi or the elderly and those with a range of health issues preventing them from performing robust exercise. 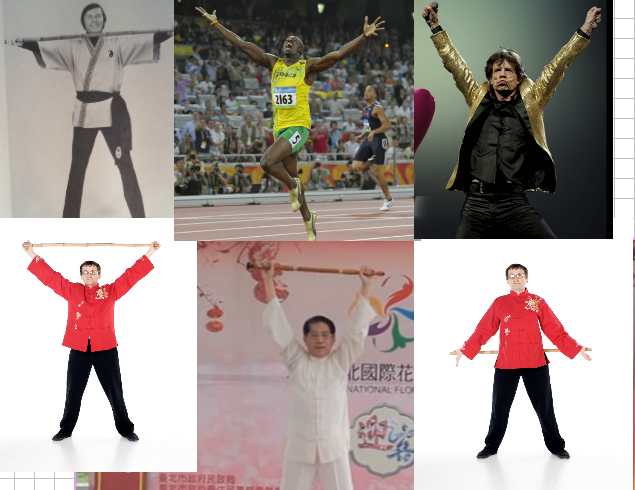 Simplified forms have been developed to improve the barriers to Tai Chi and to introduce it to a wider range of people. These simplified forms contain only a few postures; the idea is that students do not have to devote years to learn complex postures in order to gain benefit. However, the simplification process can frequently result in movements that are almost too easy. Students can find them repetitive and monotonous and uninteresting to perform. This can be frustrating because mindfulness in moving exercise is best achieved by interesting movements or movements with meaning. Tai Chi’s martial intent makes it “interesting”. If simplified forms lack the martial element they are indistinguishable from Qigong. In Qigong, mindfulness can be achieved by focusing on the body and visualizing internal energy / Qi and directing it to various parts of the body. So-called “Easy Taiji” forms that adopt the abstract mindfulness of Qigong rather than the worldly mindfulness of the martial arts can be enjoyable if the movement contains enough variety. If too repetitive they become an `empty-headed’ chore like many modern Western exercises. In a Tai Chi form there should always be martial intent with continuous flow, stepping and an awareness of single-weightedness. And so we come to the 55 Step Flow Form, which is an amalgamation of Cheng man-ching’s short form and the 24 Step Yang form that has been abridged and adapted in the tradition of “Exercise Tai Chi” evolution. 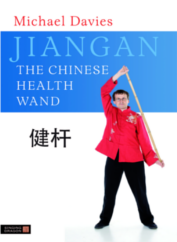 I removed the kicks, squats and postures requiring weight placed entirely on one leg because it is not efficient to have leg strengthening and “core exercises” in the midst of a moving form (that’s what the Chinese Wand Exercises are for!). In addition, too much emphasis on placing all the weight on a single leg – which is what happens in traditional tai Chi forms – can create an uneven strain on the lower back. Eliminating these type of movements has resulted in a more balanced and flowing form. I also changed footwork and weight distribution to reduce knee loading when moving forwards in bow posture. Every posture is performed on both right and left sides. The result is an interesting flowing form lasting about five minutes. More crucially I have changed Cheng man-ching’s idiosyncratic footwork (completely shifting weight from one foot to the other, then stepping out with the empty foot without any adjustment whatsoever of the weighted leg). The only explanation I have found for this is that his method “opens the kua” (hip-joint). But there are safer and more efficient methods of doing this. 1. There are no kicks, squats or single leg standing postures. 2. No more than about 65-70% of weight transferred to the front leg in bow posture. 3. With transitions between postures requiring all the weight to be on a single leg, that leg should be directly under the body and only slightly bent. 5. Stances are no more than shoulder width. 6. Every posture is performed on right and left side. 8. Breathing is taught from the outset and integrated with each posture. *Many articles have been written about avoiding injury when placing all the weight on the forward bent leg in traditional Tai Chi forms. They offer complex, long-term solutions. In the three examples below of traditional Tai Chi forms, the left (bent) leg is in front of the body and has its knee about 8-12 inches in front of the hip. With the right leg off the ground the weight of the entire body is on the left leg. This means that the left knee is taking the body’s weight at a vulnerable position. The 55 Step Form avoids this technique and only places 100% of weight on a leg if the knee is under the hip (so that the leg is almost straight).